I had set out to photograph the Austin skyline from Lou Neff Point looking across Ladybird Lake. Several things went wrong that morning and I arrived later than I had planned (I like to arrive when it is still basically dark). For this Austin image, I wanted to photograph the sky from its darkest to the point the sun broke over the horizon. 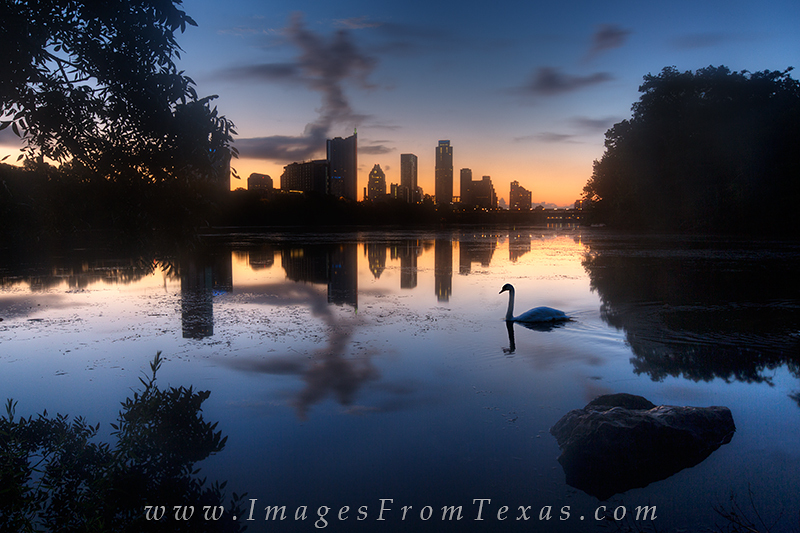 This Austin skyline image was one of the first I took that morning. Initially, I was hoping to include some ducks or waterfowl in the image, but none seemed to be around. I was shooting with a wide depth of field and a long exposure. From the corner of my eye coming at me from the right were two swans. I quickly bumped up the exposure speed, adjusted all my settings, and captured the first swan as it entered the image. After the swans departed the image, I took the same image again and blended them together so the depth would be sharp throughout. In the distance, you can see iconic Frost Bank Tower, and two buildings to its right the Austonian, the tallest building in the Austin skyline. This is one of my favorite places to photograph Texas images. Early in the mornings when I'm at this location, the only sounds I hear are the occassional joggers going by in the early hours of a Texas morning. Photo © copyright by Rob Greebon.